You know what the best thing about a new year is? A new planner! Obvi. It’s not difficult to start using a planner…it’s difficult to KEEP using a planner. I will sometimes find myself in a “funk” and don’t feel like pulling out my supplies, but then I’m so happy when I do because it brings some of that creativity back to life for me. Planning with a planner is different for everyone – you can try memory keeping, list-making, basic day planning or anything else you can image. You can even use one exclusively for menu planning or tracking your workouts. If you can dream it, you can make it! 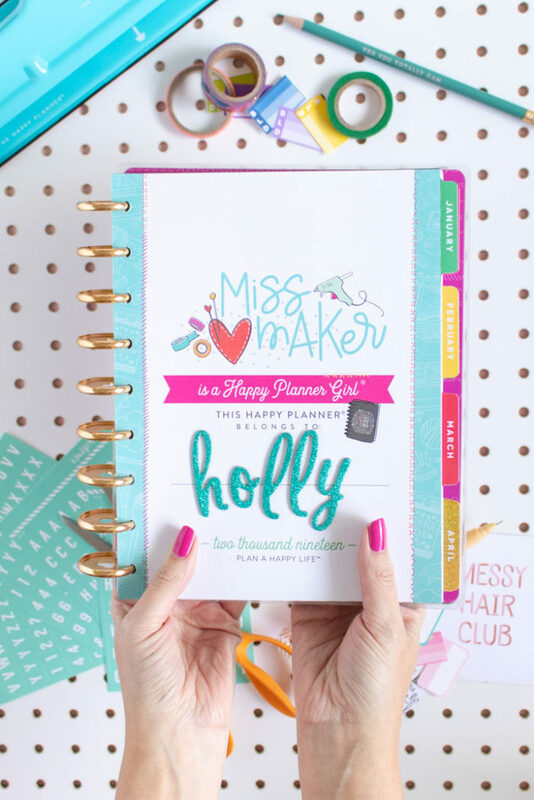 I chose the Miss Maker Happy Planner because, as you may guess by the name, it’s designed for makers like me! The weekly pages are pre-set with list sections, which helps me keep my tasks organized since I’m a list-maker type of person. 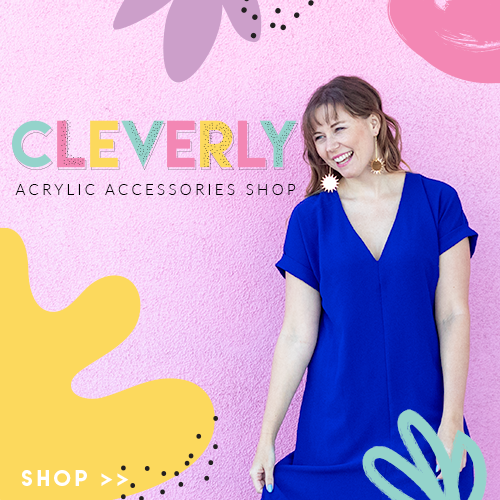 It also has cute monthly designs for creators/makers, like “been there, pinned that.” So fitting! 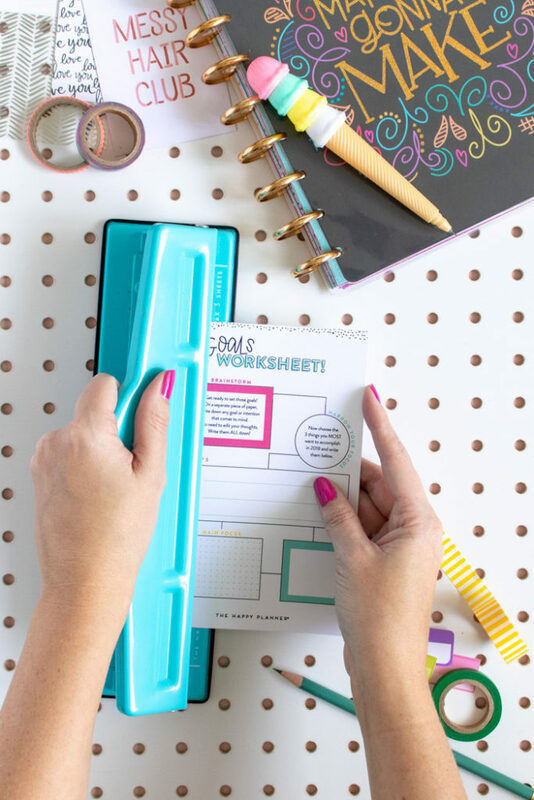 Planners come in all shapes and sizes, including mini and extra large, so you should be able to find a planner that fits your needs. 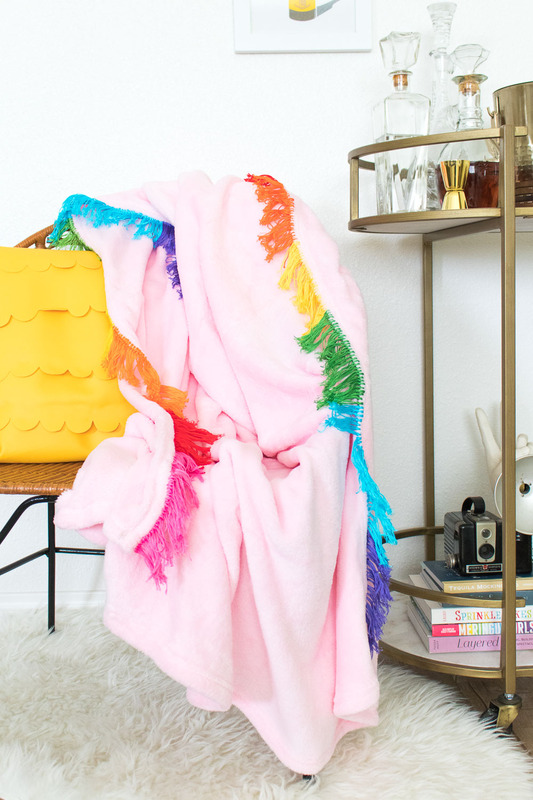 Let’s be honest – I’m a form over function kind of girl. I like pretty things, BUT a planner can be BOTH functional and beautiful. 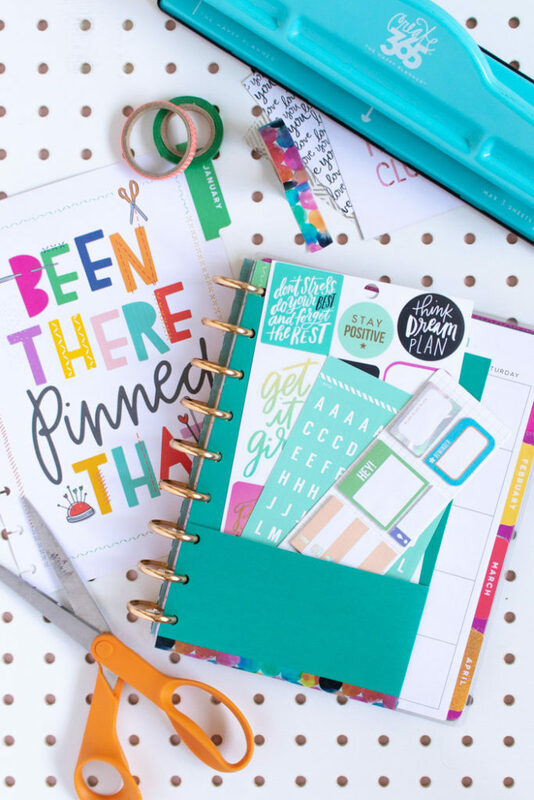 Invest in a Puncher – Because my planner uses a disc system, I purchased a Happy Planner paper punch for adding additional pages, homemade folders (more on that below) and inspirational cards. 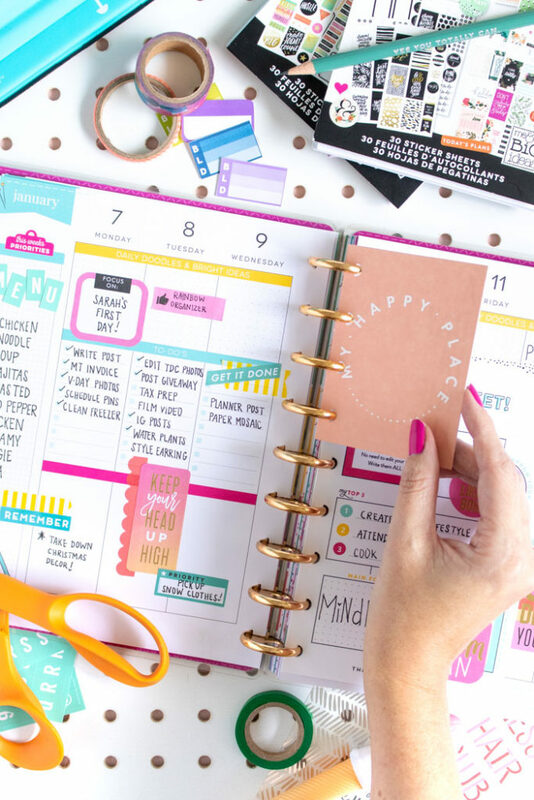 You can punch any paper product with a Happy Planner or other planner punch to add things like free printables to get started with your planner! 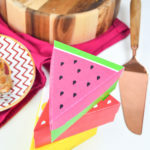 Use Washi Tape for Multiple-Day Events – Going on a trip? 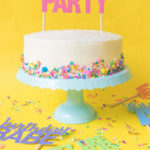 Have an all-day event? Washi tape. Spread it across several days or the length of a page to help mark out longer events and look stylish. These botanical washi tape and tropical washi tape sets are some of my favorites! My washi tape collection is getting out of hand! 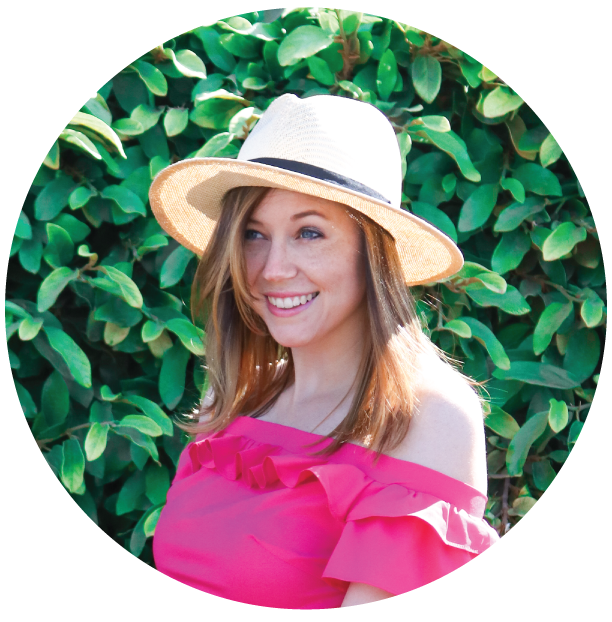 Add a Menu Sidebar – I like to use the sidebar of the first page of my week to plan out the meals I want to plan. From there, I can add specific meal plans to my days of the week with additional stickers and more details. 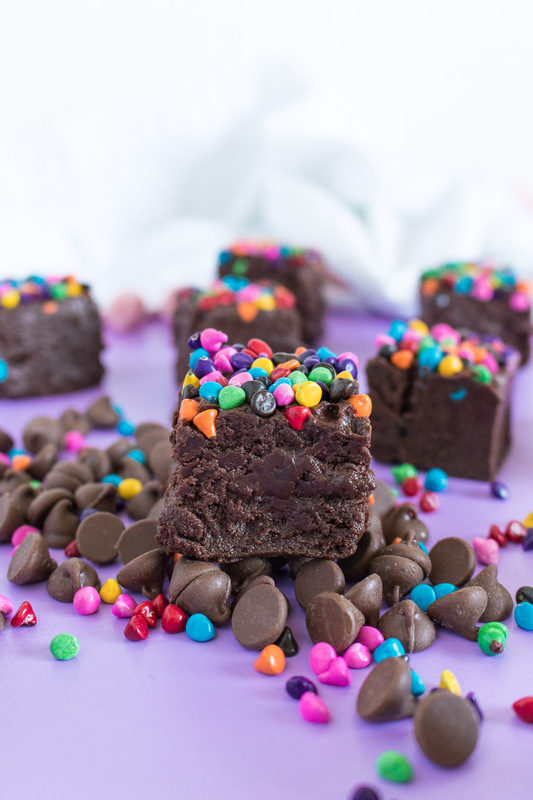 This works for me, but you can also make an insert with your planner punch! 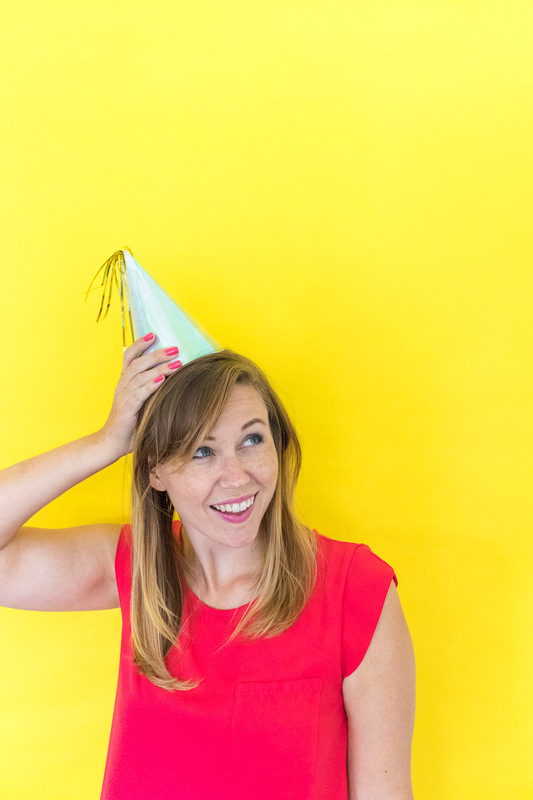 Use Sticky Notes for Flexible Events – Not sure if an event might move or change? Sticky notes to the rescue! I use cute mini sticky notes for all of my blog deadlines because I know how quickly things change, and I can move them to another day as needed. These Happy Planner sticky notes and these are my most-used by I also have tried mixing in other brands. Layer Stickers – This might be a personal preference, but I layer my stickers a lot in order to get all of the beauty of the stickers and still have some white space and room to write. 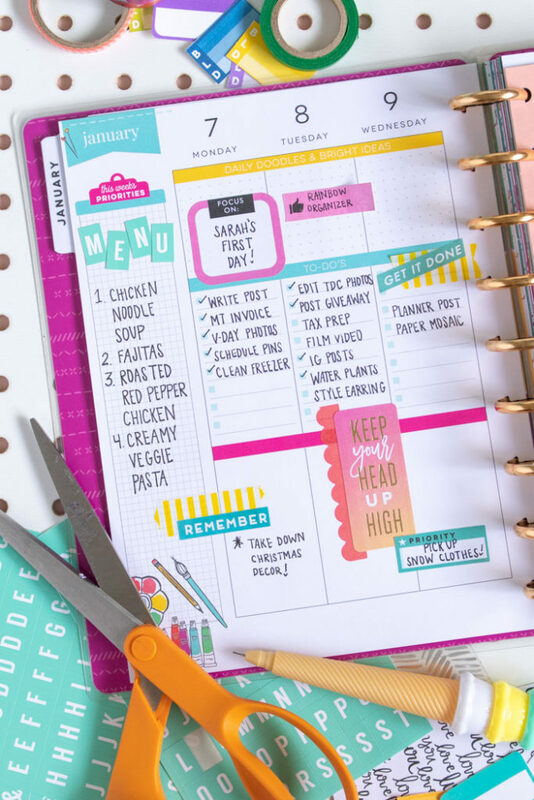 A planner obviously needs to be functional, so start with a couple stickers, see how your text is fitting in and then add as many stickers as your heart desires! I like the productivity sticker sets and watercolor sets, but Happy Planner also has specific sets designed for moms, students, teachers, travel, exercise, and more. 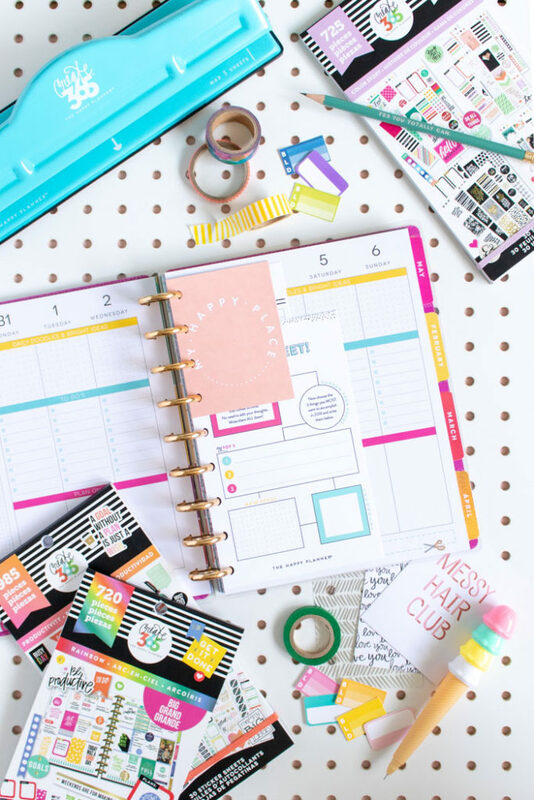 Add Homemade Planner Folders – Below is a quick tutorial for making your own folders (or you can buy cute folders like these ones that match the Miss Maker planner) to hold stickers, sticky notes, notes or other embellishments. I use mine to help organize weekly receipts as well. 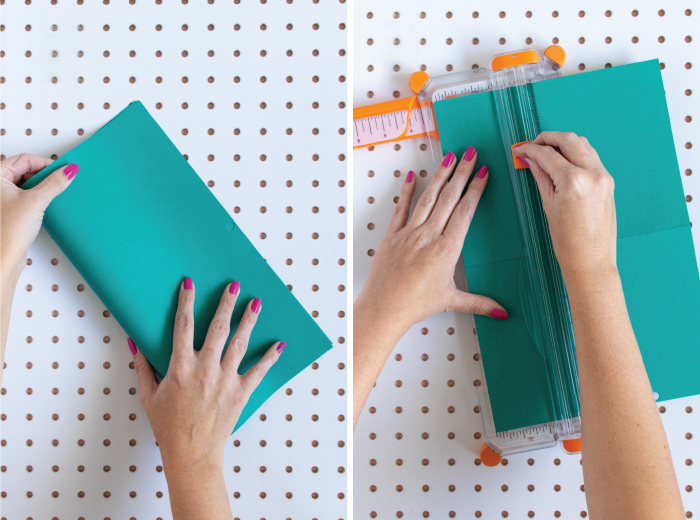 Step 1: Fold a piece of cardstock in half and cut to the height of your planner. Unfold. Step 2: With the paper unfolded, cut the pocket on the left side of the paper. Cut a 4-inch flap, stopping when you reach the fold. Step 3: Move the paper and cut along the folded line to remove the excess paper, creating a pocket shape. Step 4: Stick washi tape along the bottom to hold it together. Then punch along the open edge and insert anywhere in your planner! 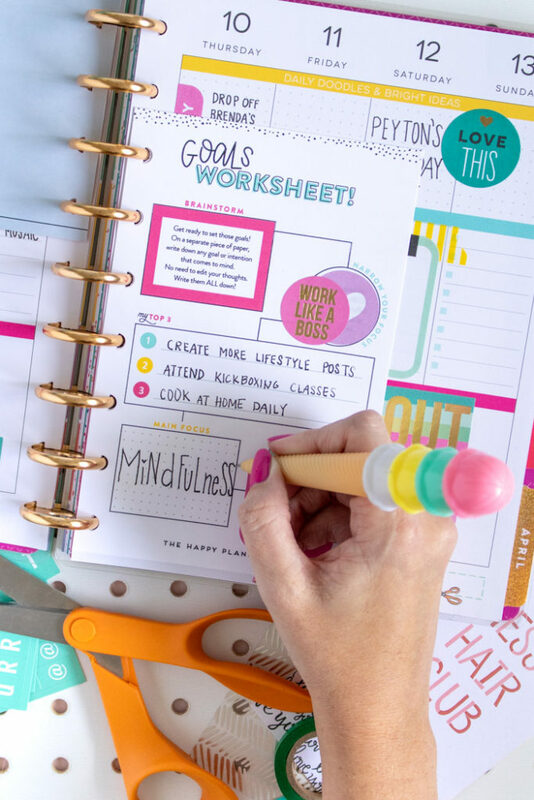 The Happy Planner – MAMBI releases its own printables from time to time, and this goals worksheet is one of my favorites! Since it’s the start of a new year, I used it to write down my top goals for the year to help keep me focused. 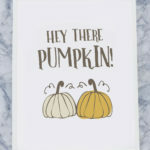 Lovely Planner – Here you can find a million and one types of printable planner stickers and pages. 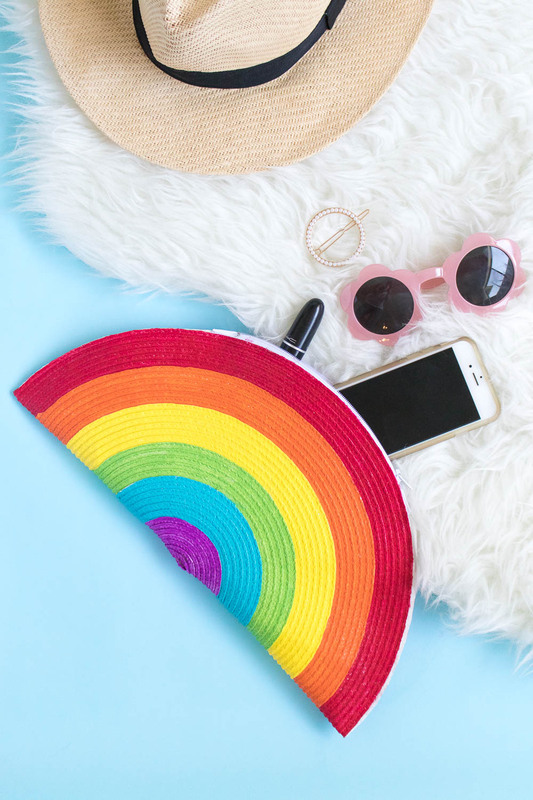 You can download any for FREE if you sign up for the email list, and you’ll receive planner tips and tricks occasionally. A few of my favorites are the simple rainbow box stickers and rainbow daily meal planner stickers. 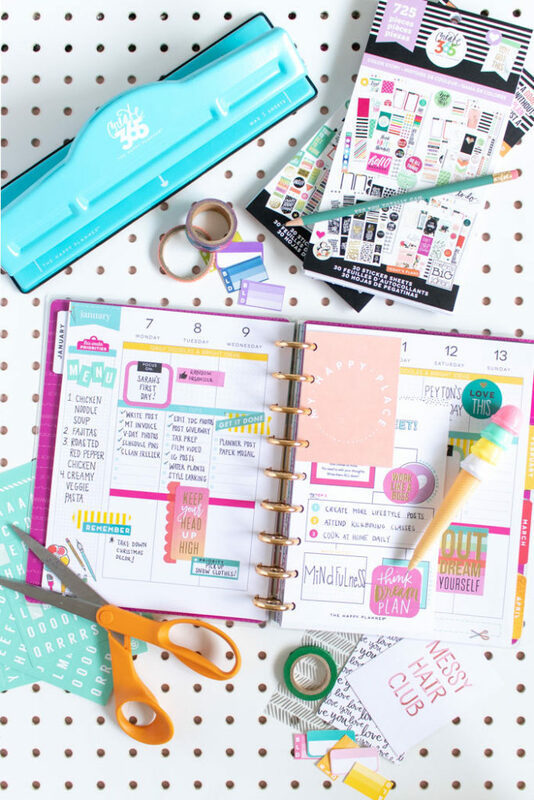 Planner Addiction – This is another great resource! I personally like the printable summer floral sticker set. Grocery List – Use this simple grocery list printable to make lists in your planner, and you can easily pull it out and take it with you to the store. Motivational Stickers – Add inspirational or motivational sayings to your planner with these Happy Planner stickers. Health Tracker – Track your health goals, like drinking enough water, with this health printable that you can punch and insert into your planner. No matter your planning style, you can absolutely start using a planner this year! 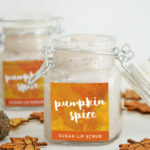 Find a coupon or utilize one of the many sales available, buy some supplies and start MAKING. 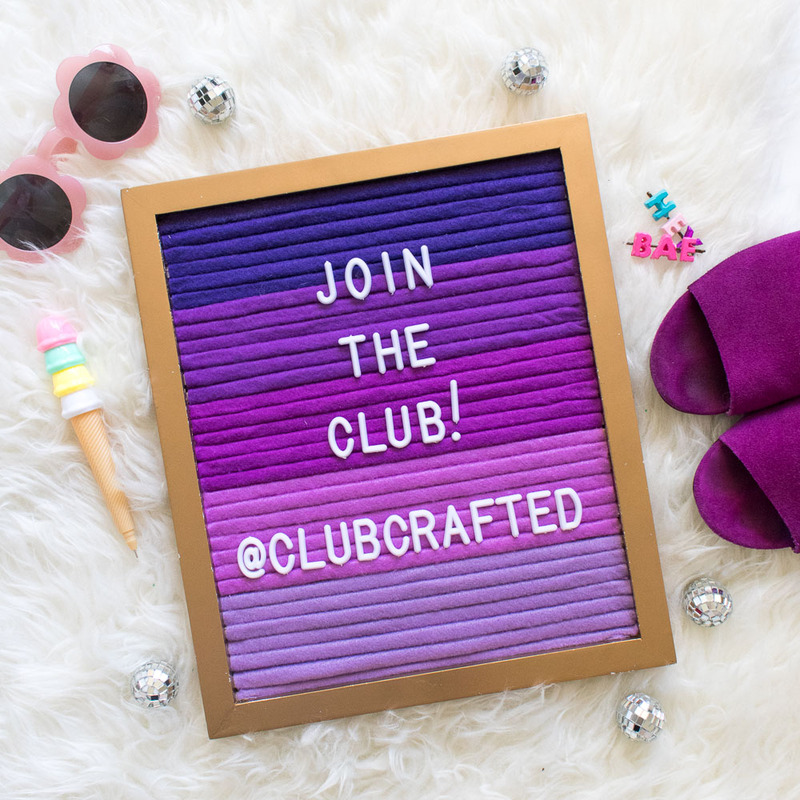 If you enjoy paper crafting, journaling or scrapbooking, your planner is sure to be your new BFF this year! !